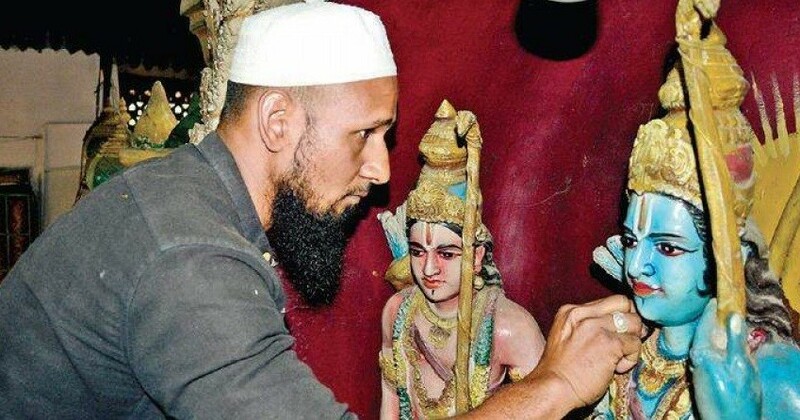 At a time when the charged-up election campaign results in politicians stoking communal disharmony, a Muslim youth in Bengaluru has hogged the headlines by cleaning a Ram temple in the city ahead of Ram Navami. Saddam Hussein, 27, has been cleaning the Srirama Seva Mandali at Rajaji Nagar in the city for the past three years. And he does it with real devotion. Every year before Ram Navami, Hussein cleans the temple, which is visited by many devotees during the festivals. Hussein got the job through his employer Venkatesh Babu, who got appointed as one of the office bearers of the temple committee. Babu, who knew Hussein for many years, offered him the temple job. According to reports, Hussein plays an important role at the temple. He looks after the temple chariot, which is taken out in a procession across Rajaji Nagar on the occasion of Ramnavami. Not just Hussein, his mother Mehaboobi is also a part of the temple's workforce. She helps in cleaning the vessels and does other jobs. Hussein said that no one has objected to his working at the temple. He says the work at the temple has only made him closer to the lord. "Everyone in the temple and my family appreciates my work and Hindu-Muslims are like brothers", he said. "I am a Muslim by birth and have been working in the temple for the last 3 years. I feel good and it gives peace of mind. I take care of complete cleaning. No one has ever objected to it", said Hussein, reports ANI. According to him, there are no issues between the Hindu and Muslim communities in the region and everyone lives in harmony. He adds that all the communal conflict is a creation of politics while common people remain peaceful. Even as another election season rekindles debate over Ram Janmabhoomi and Babri Masjid Hussein goes about his job, spreading the message of unity in diversity.